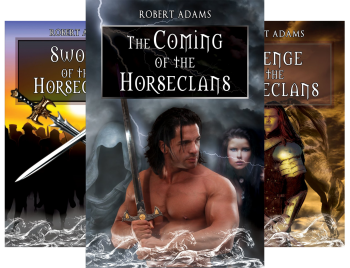 Franklin Robert Adams was a career soldier whose Horseclans series drew on his military background to lend verisimilitude to the exploits of 26th Century of immortal mutant warriors in a balkanized North America. The series ended because of Adams’ death. He also co-edited several anthologies. CLICK HERE FOR MORE STORIES BY ROBERT ADAMS. After two centuries, the undying High Lord Milo Morai has returned to the Horseclans to lead them to their prophesied destiny. First they must conquer their enemies and the Witchmen — pre-holocaust scientists who have continued living by transplanting their minds into stolen bodies. I stole most of that synopsis from the back of the book, because I only made it to page sixty-nine, the end of chapter six, and I still hadn’t gotten to the meat of the story. Castaways in Time — (1979-1989) Publisher: Could the future technology withstand the challenge of creatures out of legend?